A LoopBack 4 Application is made up of many different artifacts such as controllers, repositories, models, datasources, and so on. LoopBack 4 uses Dependency Injection to resolve dependencies on related models so your application can work as expected. To leverage Dependency Injection, we must bind these artifacts to the application context. A large application can have tens or hundreds of such artifacts. It gets very tedious to bind artifacts that many times. Enter @loopback/boot, one of the newest LoopBack 4 packages. Boot is a convention-based bootstrapper that automatically discovers artifacts and binds them to your Application’s Context. This reduces the amount of manual effort required to bind artifacts for dependency injection at scale. Currently, only Controller and Repository type artifacts are booted. Other types of artifacts such as Models, DataSources, etc. will be added as we move towards release. You can also extend LoopBack 4 by writing a custom Booter and registering it with the Bootstrapper using app.booters(MyCustomBooter). Boot the Application by calling boot() before start(). As with most things in LoopBack 4, this component was designed with extensibility in mind. @loopback/boot not only binds artifacts but lays the foundation for declarative, convention based support. Booting is a multiple-step process to collect metadata for artifacts, resolve cross references, and create representation as bindings in the context to build up your Application. @loopback/boot has a Bootstrapper which acts as an extension point for extension developers. Extensions can provide leverage the boot process by writing a class implementing the Booter interface and packaging it as part of their Component. 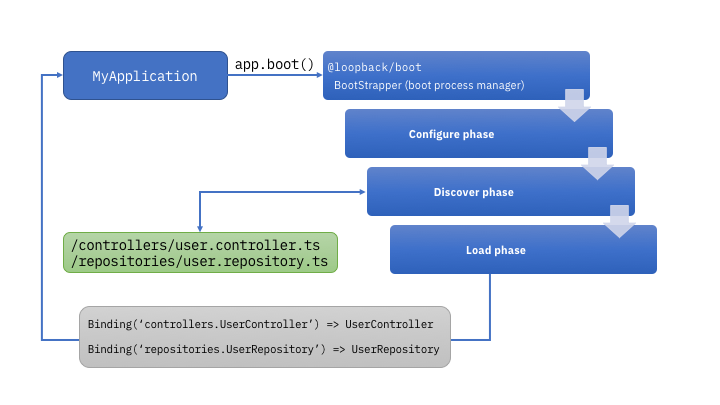 When the Application boots, the bootstrapper allows Booters to participate in each step (known as a phase) of the boot process. After a phase is completed by all registered Booters, the next phase is called. There are currently three phases: configure, discover, load. More phases may be added in the future. Extension developers can learn more about writing a custom booter here. A custom booter may be registered by a Component or an Application using the BootMixin by calling app.booter(MyCustomBooter). The diagram below provides a general outline of the boot process.